Flamenco singer Diego El Cigala burst upon the international scene in Seville, Spain years ago at a duet concert with the late Cuban piano great Bebo Valdés. It was a sold-out Womex show that those who attended won’t ever forget. He has since established himself as flamenco’s top singer, dubbed the “Sinatra of flamenco,” and as possible heir to the throne left vacant by the late flamenco great Camarón de la Isla. In his shiny suits and with his striking Romani looks, El Cigala projects a dramatic presence on stage. Click HERE for tickets and more information. Greek singer-songwriter Magda Giannikou and her group Banda Magda’s music sounds Mediterranean, continental, and fun, reminding some of Seattle’s Pink Martini. Giannikou is a versatile performer and the group excels in a variety of styles, too. Members hail from 9 different countries and sing in 6 different languages. Based in New York now, Banda Magda is gaining new fans all the time. Click HERE for tickets and more information. Cuban-born virtuoso Manuel Barrueco resides in the upper-echelon of today’s classical guitarists. He plays with a precise, subtle, yet fiery technique no matter what he tackles, be it classical, tango, or flamenco. In this afternoon performance (4:00 p.m. start), Barrueco will present a musical program that takes listeners on a tour of Spanish and Cuban history. Click HERE for tickets and more information. I am fascinated by throat singing. When Tuvan throat singers first appeared many years ago at an all-Soviet concert showcasing all the different countries in the then-Soviet bloc, an ENT doctor was dispatched to prove there wasn’t a hidden microphone or other device hidden in the singers’s clothing. There was even a blind blues singer of Cape Verdean descent in San Francisco who heard and was so smitten this unique sound that he learned how to sing it. He then travelled all the way to Tuva and won a throat-singing contest! His amazing story is recounted in the documentary film Genghis Blues. How often do westsiders in L.A. get a chance to hear a superb group of Tuvan throat singers? Don’t miss this opportunity, as hearing Tuvan throat singing live is an experience you won’t forget. You will be transported to the grasslands, steppes, and unique musical culture of this faraway land. There is also a country twang in this soulful music, just from a different country. Click HERE for tickets and more information. It has always seemed a little odd to me that the new year comes in January, and not with the arrival of spring as we see in other cultures like China and Iran. The Persian new year is called Nowruz and falls on the day of the vernal equinox. To celebrate Nowruz this year, the Farhang Foundation will present an afternoon of free all-ages performances and activities. Then in the evening, Parisa, known as “The Grande Dame of Iranian Classical Music,” will perform with top Persian classical musicians. It is the largest celebration of Nowruz in the United States. The event is free, except for the Parisa concert. Click HERE for tickets and more information. 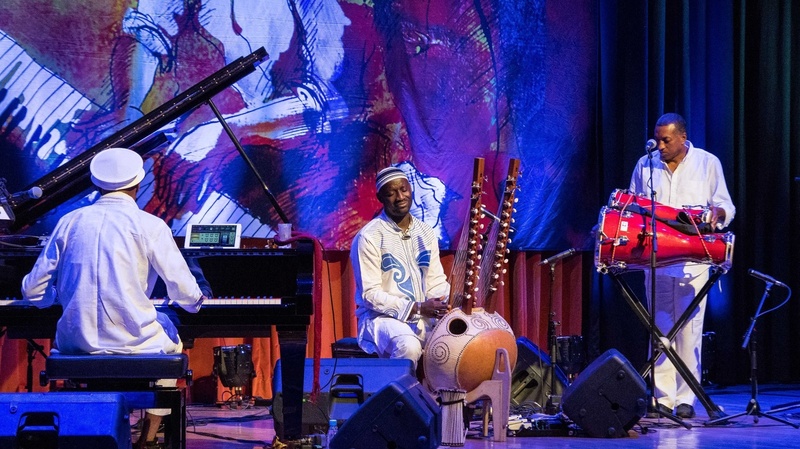 Music knows few cultural barriers, and a prime example is the collaborative project called “Transparent Water” from Cuban pianist Omar Sosa and Senegalese kora virtuoso Seckou Keita. Sosa is one of the most versatile pianists I have ever encountered, at ease with a large variety of musical styles from orchestral, Latin jazz, to hip hop and almost everything in between. Keita is a master of the kora, the 21-string harp-lute of traditional West African music. Their album together celebrates the seamless blending of Cuban and West African music. Venezuelan percussionist Gustavo Ovalles joins them in the group’s L.A. debut. Click HERE for tickets and more information. Omar Sosa & Seckou Keita 'Transparent Water' from Scott Price on Vimeo. Though co-billed for this night, the celebrated Malian singer Fatoumata Diawara will perform with her own quartet while the innovative Cuban jazz pianist Roberto Fonseca will play a separate set with his own trio. Fans can hope, however, that Diawara and Fonseca will do something together, given their 2014 collaborative tour that resulted in the live CD At Home. It was recorded at their amazing show in Marciac, France. In the clip below, Diawara and Fonseca fit together like hand and glove, and with the kora in this French show it’s a world music synergy if there ever was one. Click HERE for tickets and more information. One of the greatest and most versatile of all tabla players, Zakir Hussain is the son of the late Alla Rakha, Ravi Shankar’s handpicked tabla player. He has introduced Indian classical music and traditions to a broad audience through his collaborations with musicians in jazz, rock, and beyond. For this show, Hussain will be joined by sitarist Niladri Kumar, jazz drummer Eric Harland of Charles Lloyd’s storied group, and the drummers of Kerala, India. The evening will surely boggle the mind with exciting and complex Indian rhythms. Click HERE for tickets to the Segerstrom show and HERE for tickets to the UCLA show. The following concert footage from Prague features violin, ghatam (clay pot), and a variety of Indian drums. Hussain is on the right. It is all about interplay and virtuosity. This show is a must in my book, and you’ll have four opportunities to catch it. Hélène Grimaud is a fabulous French pianist, and I’ve listened repeatedly to her most recent album Memory. The chosen repertoire is perfect—Gershwin’s Cuban Overture and An American in Paris plus Ravel’s gorgeous Piano Concerto in G with it’s magnificent slow middle movement, and the waltzes Valses Nobles et Sentimentales. Acclaimed French conductor Lionel Bringuier leads the LA Philharmonic. Click HERE for tickets and more information. Abdullah Ibrahim (formerly known as Dollar Brand) is a giant of South African jazz. He left apartheid South Africa in the 1960’s and was “discovered” in a Zurich club by Duke Ellington, who was in Switzerland on tour. Ibrahim’s music is slow and meditative, but also can gush with a deep dose of South African soul. He has led his band Ekaya (home) for over thirty years. He returned to Los Angeles after many years away on his Jazz Epistles tour a year ago, and it’s a joy to see him come back so soon. Click HERE for tickets and more information.